We have organized a new JAM/competition for games inspired by Borges and Cortázar. That is, the topic of the comp is religion and mythology. The jam will officially start in August. But you can start your game right away. But it has a caveat. It is only for games written in Spanish. Also, it is an event, an online event, from now till the jam start we will promoting and releasing online content: talks, articles, tutorials, etc. All in Spanish. So why I announce this here? Well, in the international community there are some people who are capable (or fluent) of speak Spanish, maybe even write a game. Also, maybe someone who manages herself in Spanish could team up with natives speakers or fluent students to do a proper release as I did with Daurmith. And that is. Oh, wait, also we look for collaborations. For the online event. Ok now yes, that is. This year, Rayuela de Arena JAM 2019 starts in April the 1st, under the topic of magic realism, the marvelous style so related with Latin American literature. I love the concept… but my Spanish is just enough to get me into a bar fight. I grew up in Los Angeles, so a lot of slang and thinly veiled insults aimed at gringos. But the topic is VERY interesting. Hey, man, that sounds like a Hollywood thriller! (…) But the topic is VERY interesting. Yes, i think the same. People organizing the JAM choose a very nice/poetic topic this year. Perhaps it is a bit risky and difficult for creators, but i love it. Hey, have you considered looking for a spaniard collaborator? Also, we can help you to find one on twitter or something. Just say so, if you are still interested. Regards! It is probably going to have to wait. I have been down for 2 weeks with the flu and getting WAY behind in real world work. But I may use the theme and do an English version just because I think it is such a good idea. I appreciate the offer though, thank you. Evocative, isn’t it? Join the JAM! Yeah, please, people, come and join the jam. We, the community, would help to test your games so the grammar is top notch. First, we can recommend tools to check your Spanish grammar, then we can offer ourselves to playtest the games so the phrases sounds fluent and natural. Also, you can work in tandem as I did with Daurmith for our game Tuuli, so one could design the game and the other produce the writing. Anyway, writing in a non-native language is always difficult, but this is a JAM, the spirit of it is just to learn and have a good time, there’s no problem of showing unpolished stuff because then the player could help providing feedback. 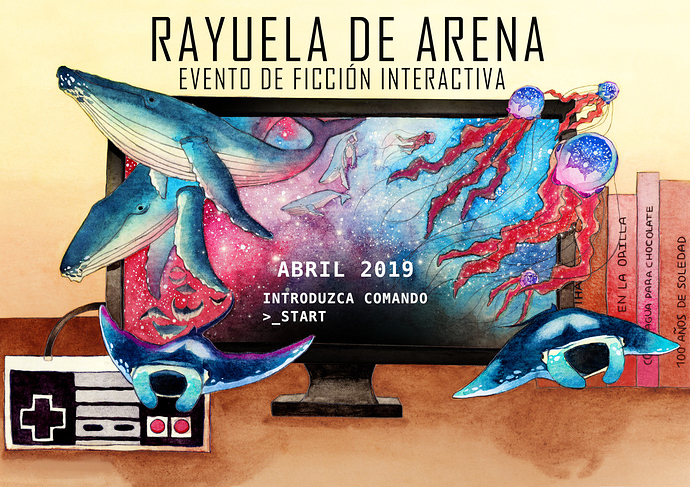 Well, 2019 Rayuela de Arena Game JAM starts today! As you will for sure know if you read all the text above, this is a Spanish language JAM for narrative games that you can join at any moment before it ends in the far, far, far away April the 30th. 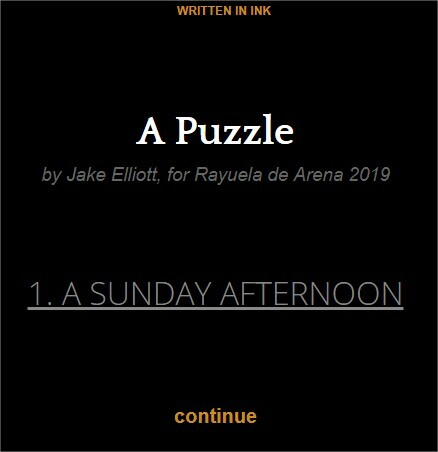 And as a gift, we have a playable keynote in English for it made by Jake Elliot, a man with a dog, member of Cardboard Computer, the people that create the beautiful Kentucky Route Zero.